Alternate title: The Junkie Blues. Altoist Art Pepper only had a few sessions left before a lengthy stint for heroin in San Quentin loomed, and while all the gory details of that are available in his peerless autobiography Straight Life (jointly written with wife Laurie), what matters is that one of our most distinctive post-war saxophonists was about to split his legacy into two epochs. On one side, former Kenton ensemble player works his way up the 1950s cool/bop divide, comfortable in either realm while beholden to neither. On the other side, battle-scarred veteran makes his peace with New Thing changes while emerging as last West Coast vet standing. These are simplifications, of course — as overly tidy as anointing Pepper another Bird acolyte. 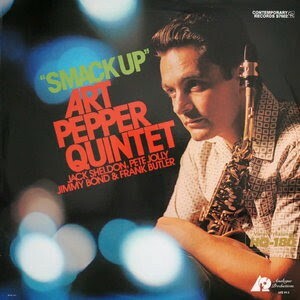 To the extent that most post-war/pre-free saxophone players were Bird acolytes, Pepper fit the description. But as Smack Up, his quasi-conceptual studio session for Contemporary, makes clear, the horn man was nobody’s mere apostle. Start with the concept, then. Six tracks, all of them compositions written by fellow saxists (including Pepper’s own bouncing “Las Cuevas de Mario”), none of the songs particularly well-known, let alone standards. Clifford Brown/Max Roach sideman Harold Land supplied the title cut, selected from Land’s punning 1958 Harold in the Land of Jazz, while Charles Mingus associate Buddy Collette’s “A Bit of Basie” originally saw light of day via the famed Hermosa Beach-based Lighthouse All Stars, with Collette himself on flute (replacing fellow West Coast sometime-flautist Bud Shank). By choosing relatively unheralded numbers by fellow sax players, Pepper offered the calmest of alternative histories in an era already rife with overplayed chestnuts. And a history it was: while looking back towards Benny Carter (“How Can You Lose”) and forward along with Ornette Coleman (“Tears Inside”), he re-introduces the already forgotten mid-century modernist likes of Duane Tatro on aching ballad “Maybe Next Year,” originally nestled inside Tatro’s 1956 octet outing Jazz for Moderns, itself a West Coast cool/Third Stream hybrid along the lines of similar efforts by Jimmy Giuffre and the Clare Fischer Orchestra. From Carter to Coleman is quite the stretch, especially in a divisive 1960 jazz climate in which acknowledging Ornette at all meant choosing sides. Neither Pepper nor trumpet player Jack Sheldon sound completely at ease atop that almost exactly contemporary Coleman number (from 1959’s Tomorrow Is the Question!) — you can hear them actively considering whether or not to play over the changes, while Pete Jolly’s piano gently intrudes after wisely laying out for the opening statement. But Pepper sounds more comfortable straying outside the lines than even John Coltrane did on his Ornette-nodding Don Cherry sessions, cut a mere four months prior to Smack Up. That is to say, Pepper calmly locates the common thread between Benny Carter’s Chocolate Dandies and Ornette Coleman’s pre-Atlantic Quartet merely by suggesting both composers deserve a seat at the same table. Chalk it up to an altoist always ready to trust his instincts and more than willing to soar without a net — in both life and onstage, winging it for better and worse.